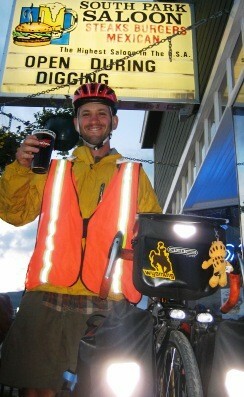 Bicycling (and beer) advocate John Greenfield celebrates the publication of his new book, Bars Across America: Drinking and Riding From Coast to Coast (Pint Size Press), in which he documents stops at 48 taprooms while on a cycling trip from Oregon to Massachusetts. The party starts at 9 PM on Friday, April 23, at Cole's tavern, 2338 N. Milwaukee. Greenfield will read from the book, with music provided by the Blue Line Riders.